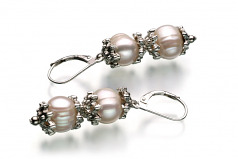 The MarieAnt collection is stylish and intriguing to those who enjoy the combination of pearls and beadwork. The white medium 8-9mm sized pearls are separated by metal beadwork that encompasses a portion of the out of round pearl before joining the next pearl. 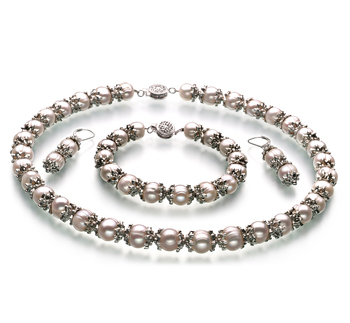 Each White pearl is separated by a top and bottom metal bead. The pearl’s luster is shining between each piece of beadwork and playing off the edges of the bead work in a magnificent display of colors. This set is a one of a kind set for that special occasion where you want to impress a special someone.